Download "EDGE V6I. 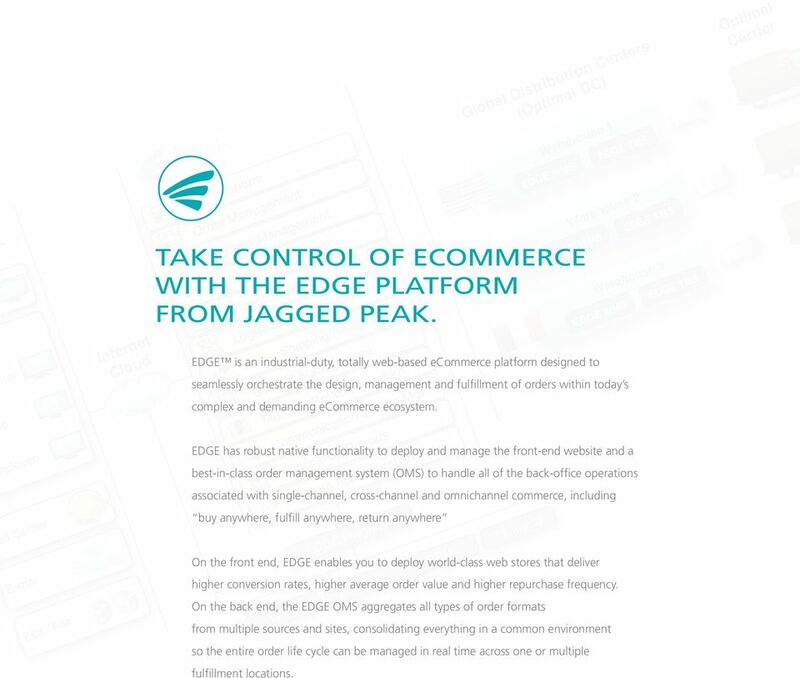 ecommerce Platform"
2 TAKE CONTROL OF ECOMMERCE WITH THE EDGE PLATFORM FROM JAGGED PEAK. EDGE is an industrial-duty, totally web-based ecommerce platform designed to seamlessly orchestrate the design, management and fulfillment of orders within today s complex and demanding ecommerce ecosystem. EDGE has robust native functionality to deploy and manage the front-end website and a best-in-class order management system (OMS) to handle all of the back-office operations associated with single-channel, cross-channel and omnichannel commerce, including buy anywhere, fulfill anywhere, return anywhere On the front end, EDGE enables you to deploy world-class web stores that deliver higher conversion rates, higher average order value and higher repurchase frequency. On the back end, the EDGE OMS aggregates all types of order formats from multiple sources and sites, consolidating everything in a common environment so the entire order life cycle can be managed in real time across one or multiple fulfillment locations. 3 ALL-IN-ONE FUNCTIONALITY With complete ECP and OMS functionality, EDGE controls the entire ecommerce ecosystem. 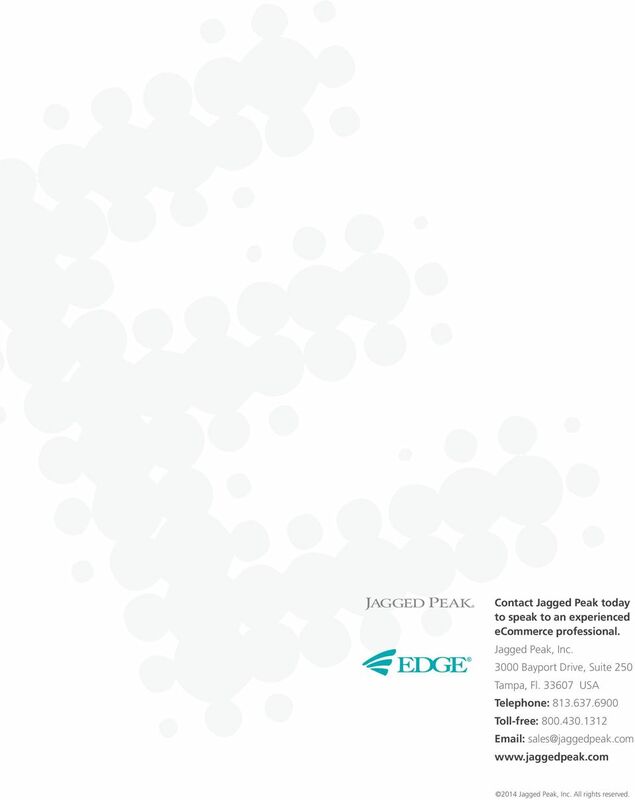 ecommerce Platform (ECP): EDGE enables Jagged Peak s clients to operate world-class web stores employing the latest tools and best practices for comprehensive content and catalog management, product merchandising and online marketing, supporting one or multiple branded web stores. 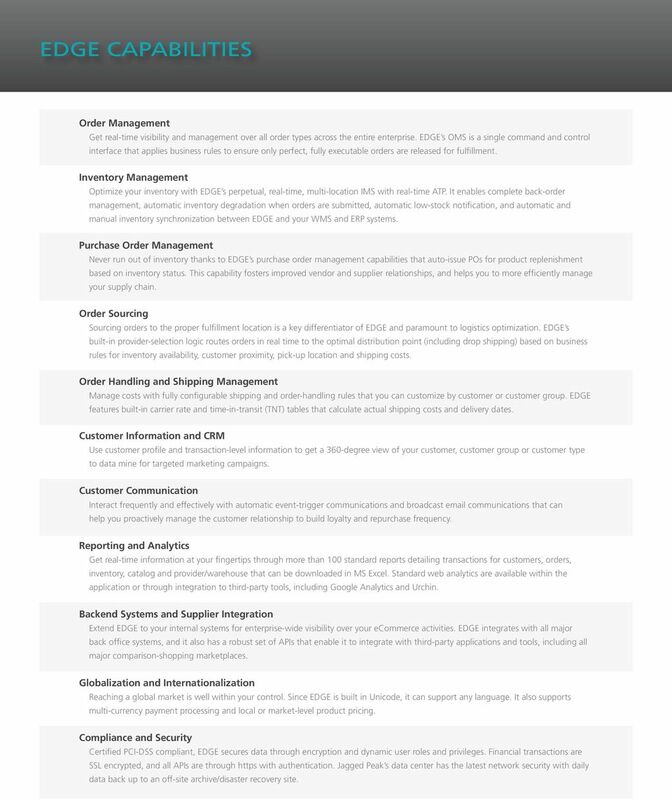 Order Management System (OMS): EDGE is a best-in-class omnichannel order management system that manages any order type from any order source and, using rules-based order handling, it ensures each order is fully executable and shippable, streamlining and expediting the pick, pack and ship process. EDGE also provides real-time inventory availability across one or more warehouses, stores or other shipping points, automatically directing orders to the optimal distribution point to save on shipping costs and provide exceptional delivery performance. The J2EE platform architecture has a built-in integration layer to seamlessly and easily connect with your back-end systems, and it can handle virtually any order volume or system demand, having been battle tested over the last decade as the platform of choice for some of the world s leading manufacturers and best-known consumer brands. 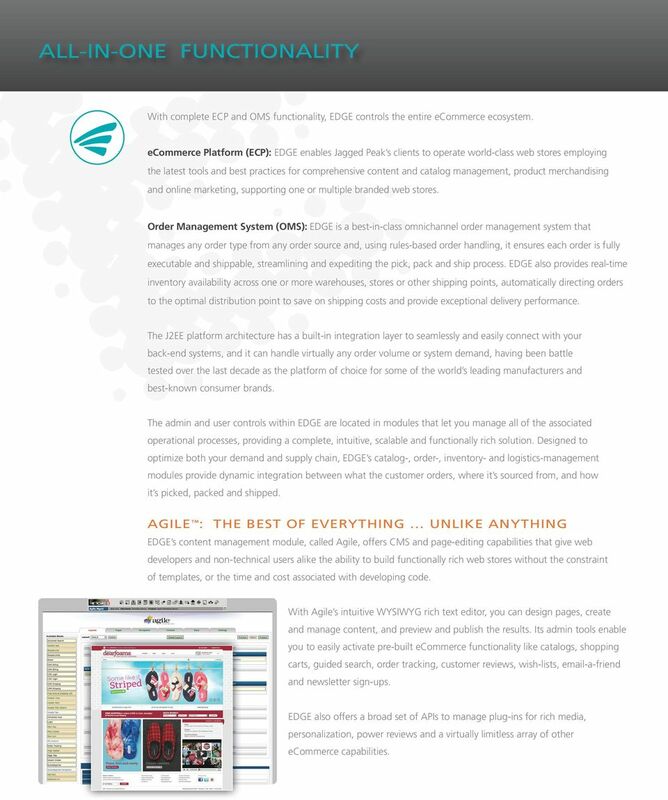 The admin and user controls within EDGE are located in modules that let you manage all of the associated operational processes, providing a complete, intuitive, scalable and functionally rich solution. Designed to optimize both your demand and supply chain, EDGE s catalog-, order-, inventory- and logistics-management modules provide dynamic integration between what the customer orders, where it s sourced from, and how it s picked, packed and shipped. AGILE : THE BEST OF EVERYTHING UNLIKE ANYTHING EDGE s content management module, called Agile, offers CMS and page-editing capabilities that give web developers and non-technical users alike the ability to build functionally rich web stores without the constraint of templates, or the time and cost associated with developing code. With Agile s intuitive WYSIWYG rich text editor, you can design pages, create and manage content, and preview and publish the results. Its admin tools enable you to easily activate pre-built ecommerce functionality like catalogs, shopping carts, guided search, order tracking, customer reviews, wish-lists, -a-friend and newsletter sign-ups. EDGE also offers a broad set of APIs to manage plug-ins for rich media, personalization, power reviews and a virtually limitless array of other ecommerce capabilities. 4 ECOMMERCE WITHOUT THE HEAVY LIFTING With EDGE doing all the heavy lifting, you can easily and cost-effectively transform your online business into a force to be reckoned with without ever breaking a sweat. Deploy and manage world-class websites that support single-channel, cross-channel, multi-channel and mobile commerce, and feature all the latest ecommerce functionality. Eliminate the need to invest in multiple applications or expensive in-house development projects because EDGE is a complete ECP and OMS. 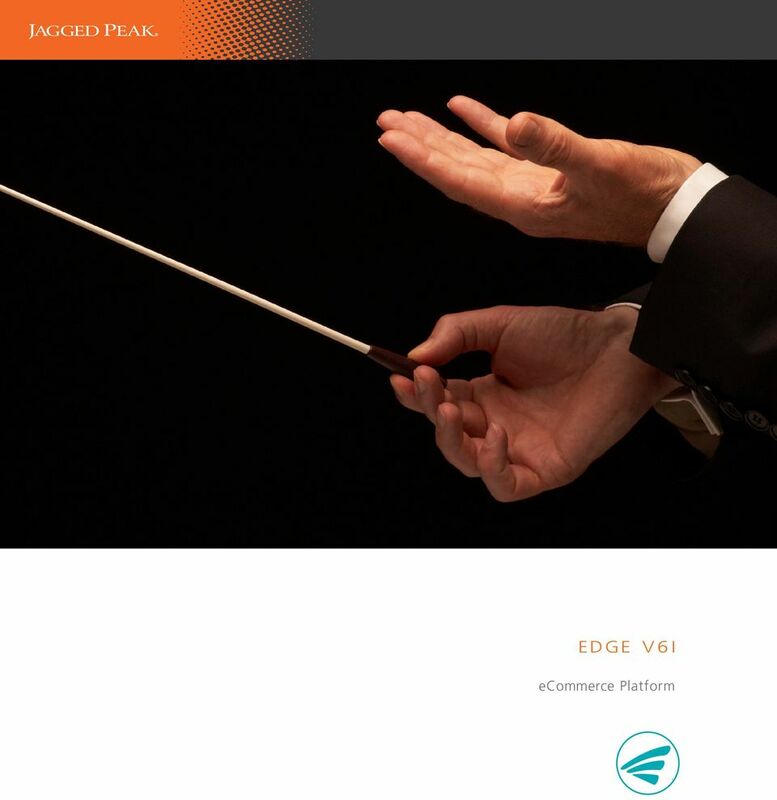 Generate improved profitability and a lower TCO because EDGE is rapidly deployed via a SaaS model. Drive more traffic and sales with easy-to-use content management, marketing, SEO and lead-tracking functionality. Maximize customer satisfaction with real-time order processing and expedited order delivery. Reduce vendor dependency and costs through in-house website and applications administration. Ensure an efficient supply chain with optimized inventory and warehouse management. Lower freight costs by automatically routing orders to the optimal warehouse, store or drop-ship provider. Grow as needed because EDGE is N+ scalable and can handle virtually any order volume or system demand. Create an enterprise-wide order management system because EDGE seamlessly integrates with and enhances the capabilities of all major ERP, WMS, TMS, IMS, CRM, Financial, PLM, demand planning and other systems. 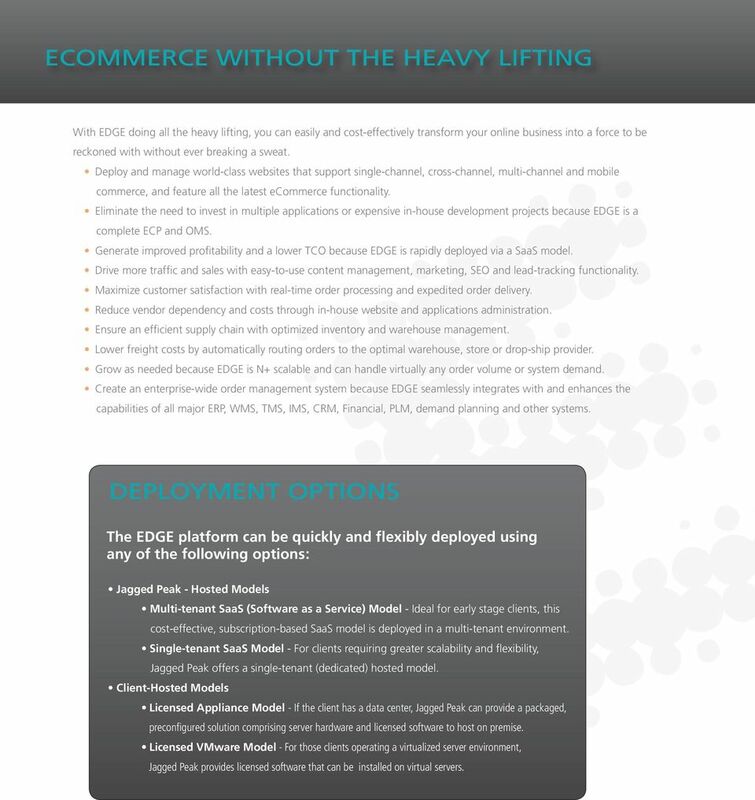 DEPLOYMENT OPTIONS The EDGE platform can be quickly and flexibly deployed using any of the following options: Jagged Peak - Hosted Models Multi-tenant SaaS (Software as a Service) Model - Ideal for early stage clients, this cost-effective, subscription-based SaaS model is deployed in a multi-tenant environment. Single-tenant SaaS Model - For clients requiring greater scalability and flexibility, Jagged Peak offers a single-tenant (dedicated) hosted model. Client-Hosted Models Licensed Appliance Model - If the client has a data center, Jagged Peak can provide a packaged, preconfigured solution comprising server hardware and licensed software to host on premise. Licensed VMware Model - For those clients operating a virtualized server environment, Jagged Peak provides licensed software that can be installed on virtual servers. 5 EDGE CAPABILITIES Website and Content Management Create and manage multi-channel B2C, B2B and mobile sites to ensure world-class site performance all via EDGE s easy-to-use Agile CMS tool that enables you to build WYSIWYG pages and content without technical knowledge or template constraints. System and Site Administration Enforce your business access policies at a granular level with EDGE s permission controls that enable you to grant or restrict access to modules or specific functionality within modules down to the individual field level. Search Engine Optimization and Social Media Integration Drive more traffic and conversions through SEO and integration to social media sites, blogs and community boards. EDGE s site maps, vanity urls, image alt tags, title-, keyword- and meta-tags/descriptions all can be auto-generated or customized for optimal effectiveness. Product Merchandising and Cataloging Stimulate sales by setting up unlimited catalog categories and subcategories with rich media and multi-variant attributes to highlight key product features. Cross-product management rules handle substitutions, cross-sells and up-sells, and other web merchandising. Navigation and Dynamic Search Enhance the visitor experience through intuitive, multi-level navigation. Dynamic keyword, filtered and advanced guided search can be refined by category, product, price range and attribute, and include logical evaluations, spelling auto-correct and synonym lookups with sorting by relevance, price, name, brand, rating, best sellers and product attributes. Pricing and Promos React quickly to revenue-building opportunities by adjusting pricing and creating promotions on the fly. Build custom sales promotions and personalized product catalogs, and using EDGE s configurable demand rules, create multiple pricing schemas as well as purchase and credit limits all without technical support. Marketing Execution Plan and implement marketing campaigns, then track order activity against them to learn what s working and what s not via EDGE s built-in reporting capabilities. Advanced affiliate marketing also tracks traffic and resulting orders, and administers commission payments. Shopping Cart and Checkout Convert visitors into happy customers with fast add-to-cart on the home page, search results and product pages, and then delight them further with express, one-click checkout. EDGE offers full- and mini-cart options with built-in controls to manage the display of products based on inventory status. Customer Service Maintain a superior customer service experience throughout all interactions via EDGE s built-in Customer Service module that gives CSRs the ability to enter, look up and manage customer orders, including updating customer address, processing returns and applying credits. Payment and Taxation Give customers multiple payment options via EDGE s real-time payment processing (includes credit cards, pre-paid value cards, gift cards, PayPal, echecks, POs and other commercially accepted payment methods). EDGE enforces tax rules for order and/or product line item, and also supports real-time domestic and international sales taxation, including geo-code level taxation. Order Capture Capture and aggregate orders in multiple formats from multiple sources, including web, EDI, flat files, or via direct entry into EDGE. 6 EDGE CAPABILITIES Order Management Get real-time visibility and management over all order types across the entire enterprise. EDGE s OMS is a single command and control interface that applies business rules to ensure only perfect, fully executable orders are released for fulfillment. Inventory Management Optimize your inventory with EDGE s perpetual, real-time, multi-location IMS with real-time ATP. It enables complete back-order management, automatic inventory degradation when orders are submitted, automatic low-stock notification, and automatic and manual inventory synchronization between EDGE and your WMS and ERP systems. Purchase Order Management Never run out of inventory thanks to EDGE s purchase order management capabilities that auto-issue POs for product replenishment based on inventory status. This capability fosters improved vendor and supplier relationships, and helps you to more efficiently manage your supply chain. Order Sourcing Sourcing orders to the proper fulfillment location is a key differentiator of EDGE and paramount to logistics optimization. EDGE s built-in provider-selection logic routes orders in real time to the optimal distribution point (including drop shipping) based on business rules for inventory availability, customer proximity, pick-up location and shipping costs. Order Handling and Shipping Management Manage costs with fully configurable shipping and order-handling rules that you can customize by customer or customer group. EDGE features built-in carrier rate and time-in-transit (TNT) tables that calculate actual shipping costs and delivery dates. Customer Information and CRM Use customer profile and transaction-level information to get a 360-degree view of your customer, customer group or customer type to data mine for targeted marketing campaigns. Customer Communication Interact frequently and effectively with automatic event-trigger communications and broadcast communications that can help you proactively manage the customer relationship to build loyalty and repurchase frequency. Reporting and Analytics Get real-time information at your fingertips through more than 100 standard reports detailing transactions for customers, orders, inventory, catalog and provider/warehouse that can be downloaded in MS Excel. Standard web analytics are available within the application or through integration to third-party tools, including Google Analytics and Urchin. Backend Systems and Supplier Integration Extend EDGE to your internal systems for enterprise-wide visibility over your ecommerce activities. EDGE integrates with all major back office systems, and it also has a robust set of APIs that enable it to integrate with third-party applications and tools, including all major comparison-shopping marketplaces. Globalization and Internationalization Reaching a global market is well within your control. Since EDGE is built in Unicode, it can support any language. It also supports multi-currency payment processing and local or market-level product pricing. Compliance and Security Certified PCI-DSS compliant, EDGE secures data through encryption and dynamic user roles and privileges. Financial transactions are SSL encrypted, and all APIs are through https with authentication. Jagged Peak s data center has the latest network security with daily data back up to an off-site archive/disaster recovery site. 7 Contact Jagged Peak today to speak to an experienced ecommerce professional. Jagged Peak, Inc Bayport Drive, Suite 250 Tampa, Fl USA Telephone: Toll-free: Jagged Peak, Inc. All rights reserved. ECOMMERCE BEST PRACTICES Optimizing the User Experience ECOMMERCE UX OVERVIEW AND BEST PRACTICES Well-performing ecommerce sites have one thing in common: they provide an outstanding customer experience. From Customer Conversion to Pick, Pack & Ship iapps and UPS Handle It All! for Retail One solution connects retail end-to-end, driving growth and fostering customer relationships. A comprehensive ecommerce solution that enables companies to build and operate a profitable direct-to-consumer business. 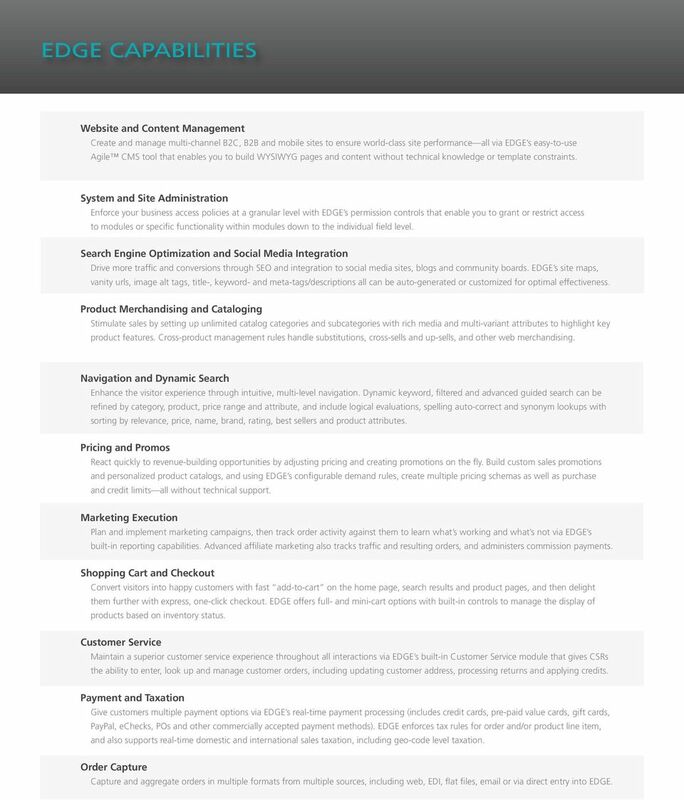 WEBMERCE IS AN ENTERPRISE SAAS CLOUD-BASED E-COMMERCE PLATFORM. CREATE YOUR PERSONALIZED E-COMMERCE EXPERIENCE TODAY! Multiple Channels, One Solution Your donors and supporters are increasingly multi-channel and they expect to get information that is relevant to their lives and interests through the channels they choose. MAGENTO CERTIFIED SOLUTION SPECIALIST EXAM. What is the difference between Omni Channel and multichannel retailing? E-Commerce ERP for successful online business.